Never fear! It’s not too late to hop on board with the backpack trend. Click through to shop 12 styles for spring, and be sure to check out our roundup of fresh and fun street style looks featuring these chic carryalls. 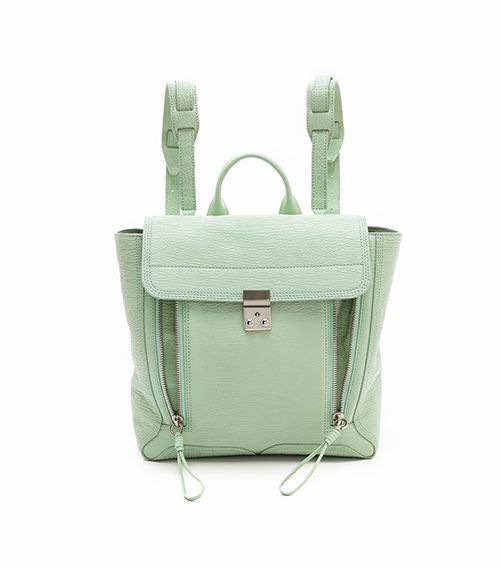 ?Just you wait, mint backpack — you’re going to look perfect next to our white spring dresses. ?A pop of neon is a fun approach to spring accessorizing! ?We can totally see Blair Eadie of Atlantic-Pacific rocking this adorable, preppy backpack. ?The toucan says it all! ?This sleek backpack has fashion editor written all over it. ?This camel-coloured backpack is weekend and work-appropriate. ?Doesn’t this backpack make you want to run off into the woods? Us too. ?The perforated details on this backpack are pretty darn chic. ?Hop on board with the Hawaiian-print trend with this playful backpack. ?We must get our hands on this patent leather backpack! ?We guarantee this radiantly-blue backpack will evoke “where’d you get that” on more than one occasion. Style Tip: Pair a vibrant, floral-print backpack with subdued staples like a blazer, button-down shirt, and jeans. Style Tip: Try mixing your backpack with playful elements, like a high ponytail and a denim vest. Style Tip: Transform your denim-on-denim look by incorporating a backpack into the mix. Style Tip: In case you missed it, we’re all about the fringe bags right now. Try yours with a lightweight sweater and a flowy skirt. Style Tip: If you’re sporting a colour-intense ensemble, tame it with a structured, white backpack. Style Tip: A graffiti-print backpack is the perfect dose of grunge your outfit has been looking for. Thank you, Chanel. Style Tip: Next time you rock a monochrome ensemble, break it up with a contrasting, striped backpack. Style Tip: Pigtails with a backpack: Don’t overthink it.